Who is the world’s greatest ever innovator? Nature has been innovating for 3.8 billion years and has mastered the ability to solve the most complex problems the world has thrown at it. There’s not an R&D department on the planet that can compete with that track record. 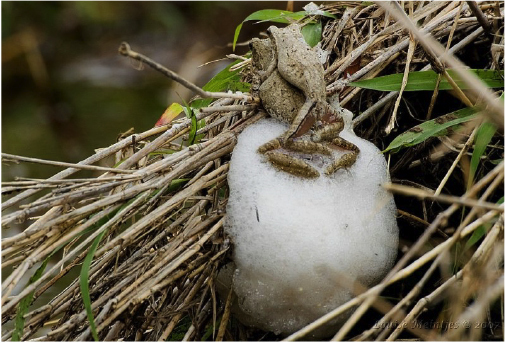 To prove the point, let’s take a look at Mother Nature’s inventiveness at helping out her amphibian friends. 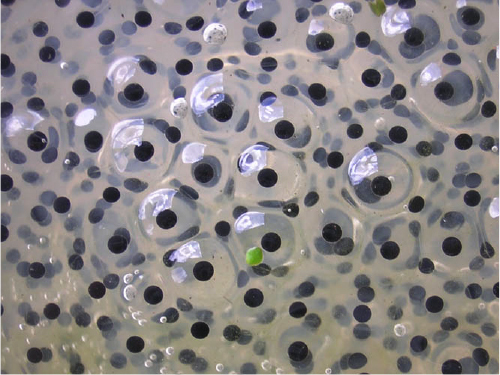 We know from an early age that frogs lay frogspawn. The trouble is, many become fish food. The frogs’ strategy is to lay as many as possible and hope a healthy number survive. Some, however, have taken a different approach. 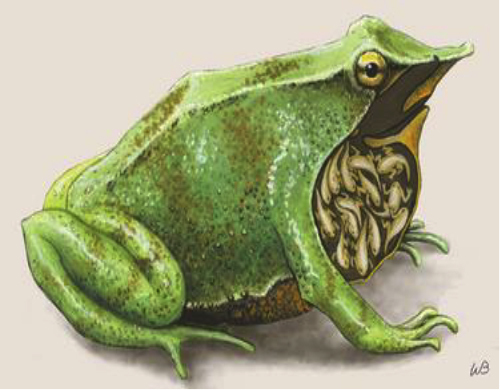 Darwin’s frog actually swallows the eggs and keeps them in its vocal sac until they hatch. 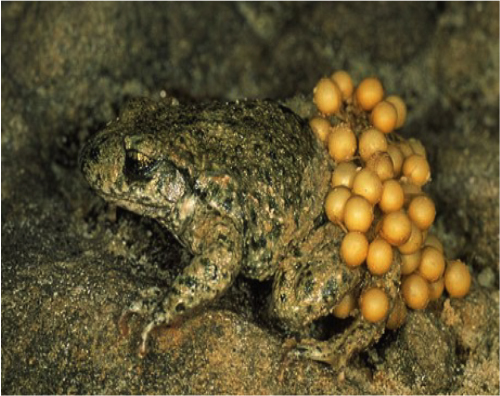 Boulanger's backpack frog lays fewer eggs and sticks them to its back to keep them close at all times. 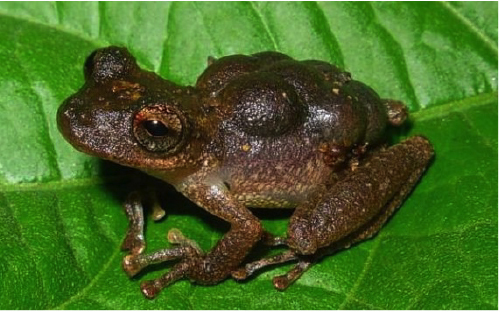 The Surinam toad takes it a step further by storing the eggs under its skin where they can’t be picked off. They erupt from the toad’s back once ready to hatch. The grey foam-nest tree frog has decided to evade the fish altogether by leaving the river and creating a foam nest for its eggs in branches above the water. These are incredibly creative ways of tackling life’s challenges. We are surrounded with examples of Mother Nature’s genius in helping plants and animals adapt and survive. She always finds a way. So what’s her secret? Let’s break it down. There are 4 steps to getting your very own Mother Nature on to create innovative ideas and new opportunities. We’ve all heard necessity is the mother of invention. Once enough of a squeeze is on, there’s no choice but to explore other options. However, by the time you realise change is necessary, it can be too late. Customers have started looking elsewhere and competitors have gained a stronger foothold. It’s a constantly changing, dog eat dog world. Learn to adapt or face extinction. Rather than wait for problems to arise, it’s better to beat necessity to the chase and create the reasons to spark innovation from within. Mother Nature never sits still and constantly responds to environmental and competitive pressures. Most of the time, these adaptations take place in the background in a process of gradual evolution. But every so often, Nature goes all out and comes up with a huge leap forward. This is known as punctuated evolution. You can take a leaf out of her book. Recognising innovation opportunities is not always looking to change the world. But occasionally you just might. Whether you’re going after small improvements or big advancements, here are several ways of going about identifying the opportunities. The first step is to open up your eyes. What problem you are attempting to solve and for whom are you creating an opportunity? Be on the lookout for things that frustrate. These are your creative fuel. What aspects are tedious, boring, time-consuming, embarrassing, difficult or confusing? It’s all too easy to just settle back and accept what we have when things are going well. But keep that healthily-dissatisfied filter on and improvement opportunities will start to present themselves. Social trends and customer preferences are often pretty fleeting so you don’t want to be stuck in the past. There are also larger social and economical trends that can fundamentally impact the way you do business. Your job is to constantly observe and be aware just how the world around you is changing and what approaches you should be ditching or embracing. 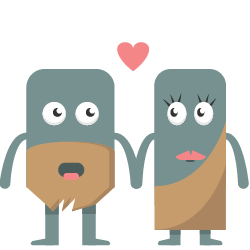 How do you want to look in 5 or 10 years to come? What competitive factors will be responsible for achieving the success you desire? Without this competitive vision, you are a sheep to the marketplace. But with this insight, you can figure out what you to achieve in the medium term, the short term and right now. This will ensure you always stay ahead of the game and take continual action. The last thing you want to do is remain stuck in the present whilst those around you take leaps forward. Most successful new technology eventually becomes mainstream. Don’t wait until everyone adopts it and end up playing catch up. Be aware of the possibilities new technology might bring. Even if you can’t see how it might assist you right now, you are keeping an open mind for new ideas and possibilities. Nature is constantly inventing and reinventing via the process of genetic mutation. 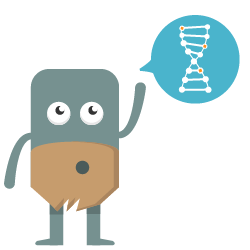 Altering DNA to see what happens is Nature’s way of experimenting with new adaptations and features. In the same way, ideas are your own DNA for growing and evolving a business. There is no judgement at this stage, it’s about being completely open to everything and anything and seeing what you can come up with. You can happily experiment with creating your own mutant ideas. Nature never stops looking for new adaptation. Neither should you. The biggest correlation of the quality of ideas is the quantity of ideas. The more ideas you can come up with, the more likely you are to find great ones. You’ll come up with plenty of bad ones too. But at this stage, all that matters is giving yourself plenty to work with and not restricting your thinking. Once you exhaust the more obvious ideas, you have to stretch yourself to dig deeper. That’s where the magic happens. How about harnessing inventions from Nature itself? Seeing as Mother Nature as solved so many problems, there’s bound to be a situation you can relate to your challenge. A huge number of Nature-inspired inventions exist. Housing engineers are looking at termite mounds to understand how to design more energy efficient cooling systems. City planners use colony swarm principles as a means of implementing the most efficient transport networks. When I get too hot, I often run my wrists under water, as this mimics how kangaroos lick their wrists to create evaporative cooling where many blood vessels are close to the surface. You too can use the principles of biomimicry to find analogous challenges in nature and recruit mentors amongst plants and animals. Whether you want to engineer, advertise, compete, or conserve, Nature has all the tricks of the trade. Find out more about training your mind for ideas in our creativity workshops. It’s the survival of the fittest. Not all ideas are going to be survivors. But you don’t know until you send them out into the wild. For Nature it’s a case of pure trial and error, but you can be smarter about it by evaluating your ideas against the factors you know to be important for success in relation to the environment and challenges faced. 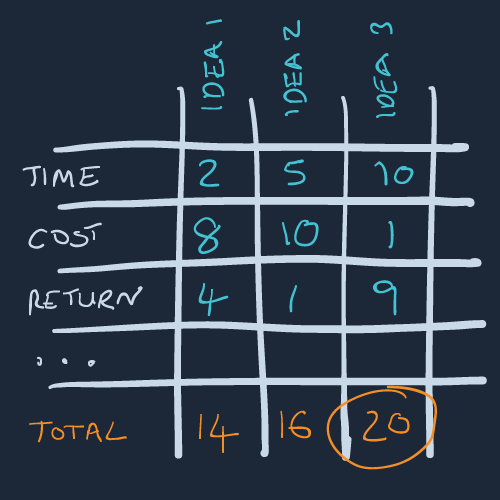 One great quick and dirty way to select the ‘fittest’ ideas is to draw up a simple 2x2 square grid. On one axis plot the relative ease and the other, the relative impact. 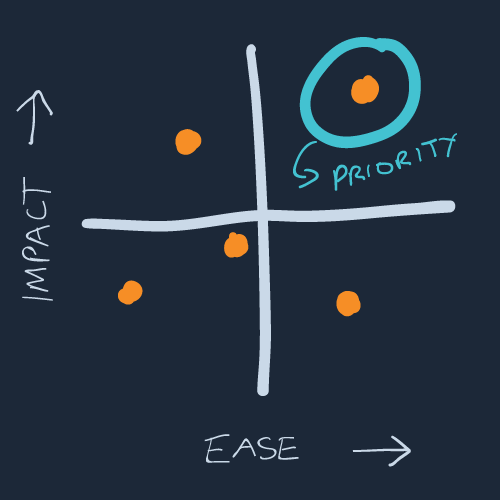 Plot out all your ideas and the ones that sit in the quadrants of highest combined ease and impact and the ones on which to focus. To get a bit more granular, you can score ideas using multivariate analysis. List out all the success factors you can think of. You might include factors such as: time, cost, potential return, technological resources, human resources, scalability, market readiness, production preparedness, difficulty of change, presentation. Now you can score your ideas against each factor. 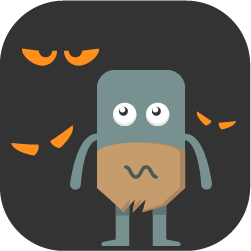 The ideas with the highest total scores are going to be your winners. Nature doesn’t measure success just on the new adaptation itself but whether it has the ability to live on. Similarly, you may seem to have a great idea, but if not executed correctly, it will never see the full light of day. It’s not about what you’ve got down on paper, your idea must to be desired in the real world. Essentially, you’re out to find it enough suitable mates! Here are various ways to determine if your idea really has it going on. The elevator pitch. Can it be summed up in a few short sentences? Is there a main focal feature? Is the core concept simple enough to comprehend? Interviews with existing customers and questioning new potential audiences. It’s easy to love our own ideas but others are more likely to say what they think and whether it’s something they actually care about. An interactive mockup online for anything digital related. You don’t need to spend time, money and effort building a website when you can just turn images into a clickable experience with tools such as Invision and Adobe XD. Ads that you can determine the level of desire through the clickthrough rate. Landing pages that enable you to gauge the potential demand through the conversion rate of visitors to signups. A/B testing to see how the new idea performs against the existing. Provide the ability for people to express their intent and desire via preorders. An old-school analogue prototype that people can touch and play with. Make it out of cardboard, or whatever items you can get your hands on to create a rough representation. Fake it. Do the work behind the scenes before the real infrastructure is in place. That way you don’t have to go all out at first and commit too many resources. 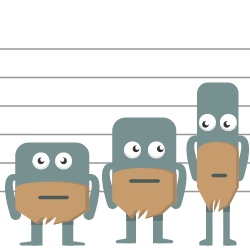 Crowdfunding to give an idea of how popular your idea is likely to be. Stick up a campaign and see what interest you can generate. So there you have it. Mother Nature is your new innovation role model. She provides you with a simple 4-step process to follow when striving for small improvements or giant leaps. 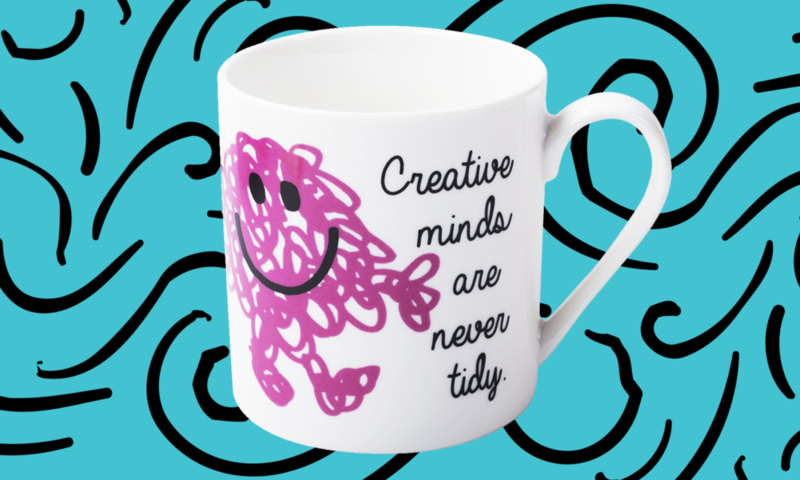 Be Messy - It’s Good for Your Creativity! © 2019 Creative Encounters makes creative thinking and doing something everyone can be confident about achieving.